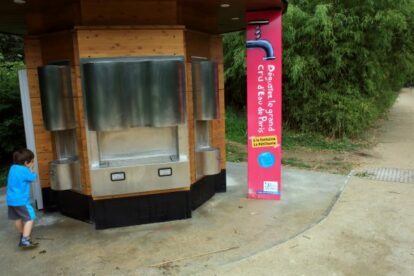 ”Eau de Paris” is the public company that manages the water supply of the city of Paris, and it substituted a private company in 2009 which cost the Parisians more money… In order to promote this public partnership, the city council of Paris decided to intensify its communication about water issues, which includes the multiplication of free fountains of drinkable water, including the original “sparkling water fountains”. The most central is located on the pedestrian banks of the river, near the Concorde bridge, in a very popular area in summertime (these banks became pedestrian – but also allows bikes and rollers – only in 2013). You can check a map of all Parisian drinking fountains here. Of course that sparkling water does not come from a local natural spring, it is simply water from the main network in which CO2 is added just below the fountain. Since the best temperature to add CO2 is 7°C, the water supplied in these fountains is very cool, so it is really a great delight on a hot summer day!